If you have construction and demolition (C&D) debris, you can sell reusable or recyclable materials (such as metal, wood, drywall, cardboard, concrete, etc.) that are separated at the job site (source-separated). You must take them to a facility that reuses or recycles those materials, such as these Registered Facilities (per the C&D ordinance). Mixed C&D debris must be transported off-site by Registered Transporters to Registered Facilities that process debris for recycling. C&D debris includes all building materials like asphalt, concrete, brick, rock, soil, lumber, gypsum wallboard, cardboard and other packaging, roofing, tile, carpeting, fixtures, pipes, metals, tree stumps and vegetation from clearing land. 100% of C&D debris cannot be put in the garbage or landfill. Styrene in foam foodware can leach into food and drink can cause cancer in humans. And polystyrene foam breaks into smaller, non-biodegradable pieces that are eaten by animals, which can harm or kill them. 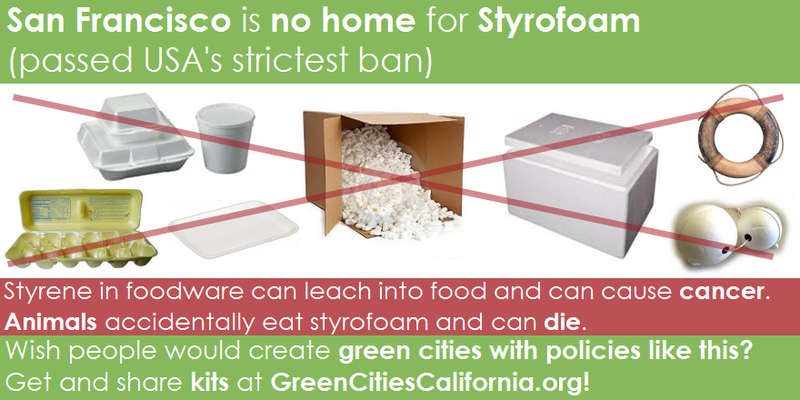 The 2007 San Francisco Food Waste Reduction Ordinance banned Styrofoam foodware and required the use of compostable or recyclable foodware. A plastic-like product does not compost unless it has a logo of these certifiers: Biodegradable Products Institute, Din Certco AIB Vinçotte Inter (Belgium), Japan Bioplastics Association or Australian Environmental Labeling Association. So prohibited bags and foodware include ones with unsubstantiated claims like “green”, “environmentally friendly,” “biodegradable,” “degradable,” “will decompose,” “photodegradable,” “made from corn starch.” They have not been tested for compostability. The 2007 ordinance had the most comprehensive list of acceptable compostable and recyclable foodware compared to other food ban ordinances. The 2016 Food Service and Packaging Waste Reduction ordinance bans the most foam products in the USA. Protect our health and environment by creating zero waste. Anyone can help violators get a friendly reminder. City litter audits from 2007 to 2009 showed that there was a 41% decrease in Styrofoam use. "Styro-busters" that visit over 3,000 food service providers regarding how to comply. A list of compostable and recyclable foodware vendors nationwide. Outreach to all affected businesses for four years. Within only three hours, volunteers picked up over 75,000 pounds of trash from Santa Monica beaches, most of which was polystyrene foam and plastic. Styrene in foam foodware can leach into food and drink and can cause cancer in humans. And polystyrene foam breaks into smaller, non-biodegradable pieces that are eaten by animals, which can harm or kill them. Help businesses get a friendly reminder if they use banned, non-recyclable plastic with the recycling symbol #6. Unlike San Francisco's and Richmond's foodware ordinances, Santa Monica does not recommend bio-plastics because they contaminate recycling bins and the city cannot compost them (even if they are labelled "compostable"). The city also created a guide on how food providers can use and promote reusable foodware, create less waste, and serve healthy food. For example, some vendors got creative and used paper cones for fries. The city also encourages food providers to save money on foodware by giving customers discounts or other treats if they bring reusable foodware. Protect people and animals from cancer-causing styrene foodware and prevent waste. Prepared food providers and City operations, city managed concessions, and city sponsored and permitted events. Over 600 food vendors, 100 food trucks and all city facilities stopped using non-recyclable foodware as of 2012. Santa Monica Airport uses compostable-coated paper cups, paper plates and bowls and 100% post-consumer recycled napkins. Santa Monica City College and all private and public school have phased out all polystyrene in their cafeterias. No one requested an exemption (or went out of business due to the ban) and less than 5% of food vendors received warnings or citations. The City was awarded the 2010 Outstanding Waste Prevention Award from the California Resource Recovery Association (CRRA) for their groundbreaking policy. Additional staff (0.25 full time equivalent) and funding for materials were needed to conduct workshops and outreach during a two-year interim period. The budget to implement the ban was approximately $45,000. Fines fund the program. The city penalizes violators with a written warning first, $100 for the second violation, then daily fines of up to $250 for subsequent violations. Not give out single-use plastic checkout bags. Charge a $0.10 minimum to customers on all compliant checkout bags which are compostable plastic with the Biodegradable Products Institute certification logo, paper labeled with 40% post-consumer recycled content, or washable and reusable for at least 125 uses. Stores keep the charge. Display the $0.10 charge separately on the customer receipt. Not charge food assistance recipients. San Francisco was the first city in the U.S. to ban single-use plastic bags. As of 2015, over 130 jurisdictions in California have followed. Unlike the Los Angeles county ban, it also applies to food establishments. To reduce the number of single-use plastic bags and incentivize the use of reusable bags. Help non-compliant retailers and food establishments get a friendly reminder. The $0.10 charge per bag reduced the number of disposable bags used by over 70% and reduced trash in the streets. Can fine building owners $100-1,000 if they do not give tenants blue recycling, green composting, and black landfill bins and information on what to put in them. Businesses can save up to 75% off their bill by reducing the size of their landfill bin or frequency of pick-up. This ordinance is the strictest and most comprehensive recycling and composting law in the U.S. because it requires everyone to comply: residents, businesses and governments. To achieve zero waste by 2020. All residents, businesses and city departments. You can help building owners get a friendly reminder. Over 8,700 apartment buildings and 16,000 commercial buildings have composting and recycling services, giving the ordinance a 99% compliance rate.